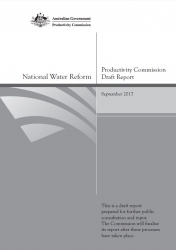 The Productivity Commission has released a draft of the National Water Reform report this month, and is calling for feedback from interested parties. Focusing on the progress of the National Water Initiative, the report recommends that Governments need to especially respond to the challenges posed by population growth and the impacts of climate change. Without action, these issues will result in substantially more people, but less water in the future. Have your say on the draft report by 19 October 2017 via the Productivity Commission. The final report is expected to be handed to the Australian Government by 31 December 2017. Further information can be found at www.pc.gov.au.